Appetizers, beverages, desserts (chocolate! ), art sale, student artwork display, silent auction, raffle, live music! 100 pieces of artwork for sale, made by forty different artists. The Community Arts Project has been providing supplemental art lessons to schools in our community for 31 years. 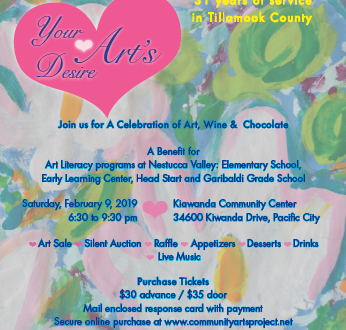 Sales contribute to help raise funds for Art Literacy programs at local schools including Nestucca Elementary, Garibaldi Grade School, Early Learning Center and Head Start. Advance tickets $30; at the door $35. Secure online ticket purchase is available at www.communityartsproject.netFor more information, contact Nicola Harrison at email: communityartsproject101@gmail.com to answer questions. We hope you will join us for this special celebration. Come support our young artists. Art matters.